Tarasingh standing in front of the burnt remains of his home. A 52-year-old farmer is now contemplating his next move after his two-story wooden and concrete home went up in flames last Friday evening. 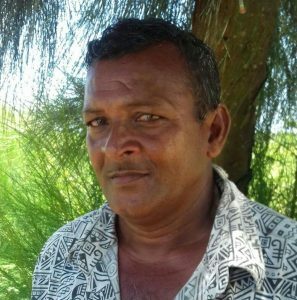 The man, Tarasingh, of Coconut Dam, Naarstigheid, West Coast of Berbice is estimating over $1.5M in losses. Speaking with Demerara Waves Online Newd, the man said that on Friday at around 5:00 PM he,along with his 14-year-old daughter, secured the home and left to sell their produce at the Parika Market. According to him, at around 11:00 pm Frida evening, neighbours called informing him that his entire home was engulfed in flames. The man quickly returned and was met with the raging fire destroying his home. 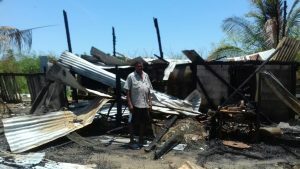 The man is of the view that arsonists torched his home, citing on ongoing issue with a top Region 5 official regarding the plot of land the house was built on. He also highlighted that the house was powered by solar panels and all appliances were turned off when they departed. Tarasingh admitted to squatting on the land belonging to the government and noted that he, along with seven other persons, expected to receive one acre of land each from the Government when they begin the regularization of the land. Tarasingh is seeking any assistance from the general public. Persons can make contact with him on phone number 691-7167.